I’d be lying if I said I saw much of Aruba. I’d also be lying if I said I saw much of its capital city Oranjestad, except in panorama from the observation deck of our cruise ship. I did experience the shopping areas within a few blocks of the cruise terminal. A true encounter with Aruba will require a second and extended visit, not one that starts with a submarine ride out in a reef in mid morning, an hour or two in a mall near the cruise terminal in the WiFi hotspot, plus some time shopping to prove you were somewhere exotic. As far as marketing is concerned, the Aruba Chamber of Commerce at least is consistent. Their motto is “Aruba: One Happy Island”. It is hard to argue otherwise. Its logo adorns almost all the T-shirts, hats, trinkets and other stuff that goes home with tourists. Of the three adjacent Dutch “ABC” islands (Aruba, Bonaire and Curacao) that hug the Venezuelan coast, Aruba definitely matches your mental image of what an Caribbean island should look like. It looks a lot like Miami Beach, at least in better times with its golden and sandy beaches, aquamarine water close to shore and blue water a bit further out, palm trees lining its popular beaches (probably planted there to draw tourist traffic) and a mixture of well-moneyed tourists and residents jamming its streets. 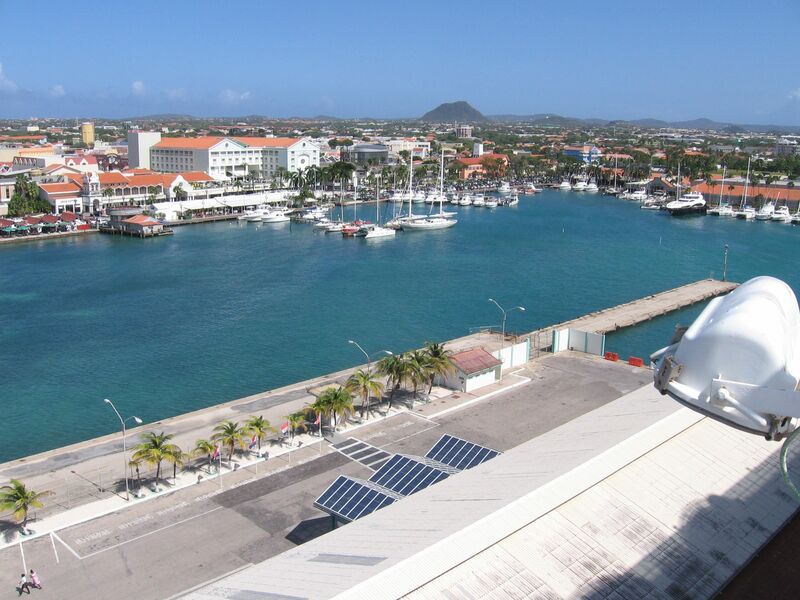 For an island of about a hundred thousand people, Oranjestad itself looks like it has more residents than that. It comes across as a large city, certainly bigger than Willemstad on Curacao. Moreover it is a stylish city. It’s easy to tell the tourists from the residents. The tourists are largely Americans or Canadians, and we are in shorts and T-shirts and our bellies precede us by a significant amount. We are also largely Caucasian. The residents frankly look a whole lot better. They are stylish and for the most part slim, mostly mixed Caribbean in the darker hues. They are not just stylish but overall they are attractive and look very healthy. It must be due to the tropical fruits that they eat. I do my best not to lear at attractive women. I was having a hard time Friday. Sorry dear, if one of these slim dark brown goddesses in high heels and slit skirts gave me a come hither look, you’d be history. 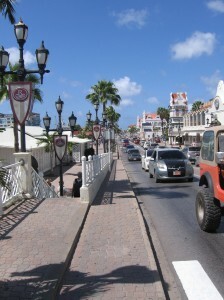 If Willemstad on Curacao is the Caribbean’s nexus, Oranjestad is its Los Angeles, minus the air pollution. In fact, residents of LA sick of the pollution might want to move to Aruba instead. It’s just as dry and sunny, and it has all its fashion with fewer of its bums and winos. And frankly, the view in pretty much every direction is satisfying for lovers of the tropics. While it lacks a tropical rainforest and much in the way of rain, it makes up for in its beaches, water, general cleanliness and general prosperity. The ABC islands do have their language in common: Papiamento. Unsurprisingly, English is widely used in the tourist areas. One difference in Aruba is that it has its own currency. The U.S. dollar is widely used too, but the official currency is the Arubian Florin. At our other ports of call, dollars were the official currency. Shops may not accept dollars, as we found out at a local Subway, but plastic seems to work instead. Aruba is clearly growing, as evidenced by the new construction near the cruise port with luxury condos under construction. As in Curacao, Americans are likely to find their favorite brands here, including two Starbucks with a couple of blocks of each other. The local mall was definitely high end. 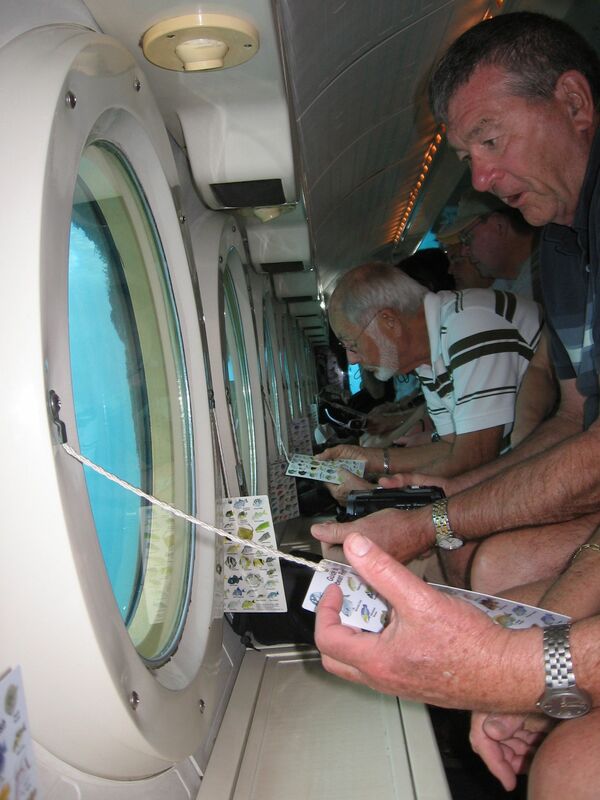 Also conveniently available are port side casinos and slow traffic on roads near the cruise port. With its dry climate, vegetation tends to be more bush-like than tree-like. There are no mountains, but there are hills that look like mountains, sometimes poking up in relatively flat areas. I do expect to be back to Aruba someday. If you like tropical ports of call, you will feel quite at home.